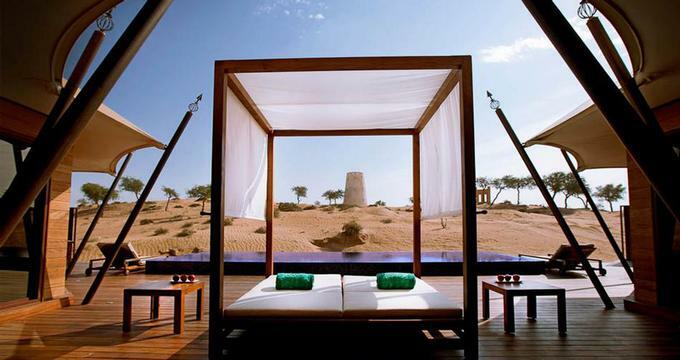 Banyan Tree Al Wadi is a luxury desert resort in the United Arab Emirates, complete with a nature reserve, an Asian-inspired spa and a private beach. Guests are accommodated in huge tented villas, all with private pools, day beds and cabanas right on the beach. Villa bedrooms have beautiful canopied ceilings and modern Arabic decor. Al Sahari Tented Pool Villa offers the most privacy and the most spacious layout. You can request massages in the privacy of your own villa and relax next to the gorgeous designer pool. The reserve spans 100 hectares of desert and protects indigenous fauna and flora. Take a walk through the resort grounds to view the animals and the plants. A getaway for spa lovers and adventure seekers, the property offers an intriguing combination of Asian healing techniques and romantic Arabian architecture. This unique wellness center is located on a nature preserve in the desert in the United Arab Emirates. The resort offers Asian-inspired hydrotherapy facilities and lavish treatment pavilions surrounded by the Arabian Gulf and the magnificent Al Hajjar Mountains. Therapists receive formal training at Academies in Indonesia, Thailand and China. There are several awesome signature treatments to choose from. Try the Rainforest Indulgence which includes a cascading shower of the Rain Walk, high-temperature Aroma Steam chambers, Sauna, a cold rub-down at the Ice Igloo a body massage and more. The resort villas are spacious and luxurious, perfect for indulging in treatments by the pool. The resort offers many exciting activities, including falconry where you can learn about falcons, eagles and other birds from up close. The activity center offers many activities such as safaris, bird watching and bike trails. Pool villa rates start at AED 1,360 per night.